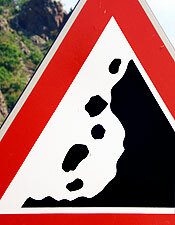 Well balanced design: old and modern roadsigns with irregular boulders which is only natural (despite the E.U. 's regulators wanting to calibrate everything —even snow flakes if we may believe F'Murr in Le génie des alpages ). 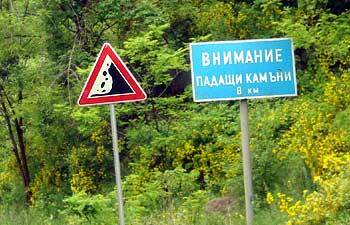 This doesn't mean we shouldn't keep an eye on them (the Bulgarian roadsign people), because they quietly made the number of boulders drop by two! That's how lean sizing often comes, in a sneaky way. Let's focus on the stones lying on the ground. That's kind of peculiar and only rarely found. 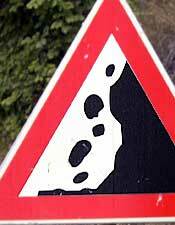 But really weird is that the fallen stones are much smaller than the rest. They can't be melting away from the heat, can they? 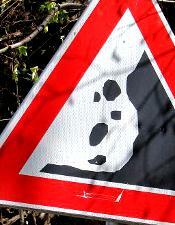 Or is the rock wall surrounded by quicksand? And why has pict. 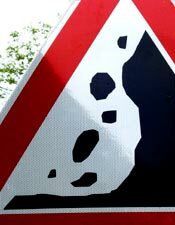 5 three stones giving the sum of 8 while no sign shows more than 7 in the air? More research is needed. 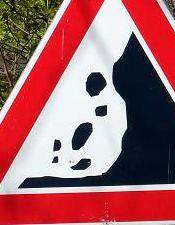 Some Falling Rock signs from France feature also stones on the ground and they look perfectly normal. Notice the dance of the small stone.